Not all bottles were created equal. Bfree’s flagship bottle with the patented air vent has helped millions of babies all over the world by making feeding easier than ever, helping prevent colic, gas and even ear infections. Not all bottles were created equal. Bfree’s flagship bottle with the patented air vent has helped millions of babies all over the world by making feeding easier than ever, helping prevent colic, gas and even ear infections. A significant problem many parents aren’t aware of is vacuum, which forms in most baby bottles. Vacuum has been proven to be a major cause of gas, colic and even ear infections since it forces baby to suckle extra hard in order to extract milk from the bottle. Ear disease in infants can be associated with bottle feeding. When using standard baby feeding bottles that are non-ventilated or completely under-ventilated, the vacuum (negative pressure) which forms in them during a feeding may lead to development of secretory otitis causing hearing impairment and a risk for delayed speech development. Bfree has a patented air vent that helps prevent vacuum formation, helping baby to suckle comfortably and control the flow of milk, without causing pressure in the ear. Unique air vents are found in all Bfree bottles and cups and grow with your baby from age 0-3. 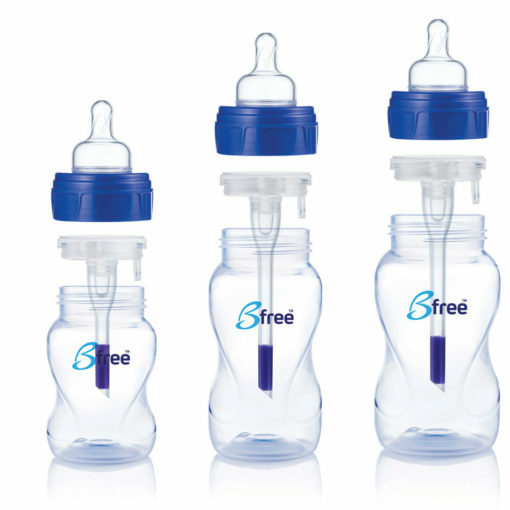 Bfree was the first global brand to use the safe BPA free plastics. All Bfree Classic and Happy Me bottles are made from strong, durable, safe and UV protective plastic. The bottles warn when content is too hot; the safety heat sensor changes color visibly on the inside of the bottle. All bottles have a special sealing disk included so you can seal and store contents in either in the fridge or freezer for later use. All Bfree bottles use safe BPA free plastics that are strong, durable, safe and UV protective. Every part of the Bfree Classic, Happy Me, and Super Glass bottle can be used on any other Bfree Classic, Happy Me, and Super Glass bottle or cup.